The Massachusetts hockey team is the top-ranked college hockey team in the nation. The most recent USCHO poll, released Monday morning, had UMass in the No. 1 spot with 26 first-place votes. It marks the first time the Minutemen have ever been voted as the top team in the country. 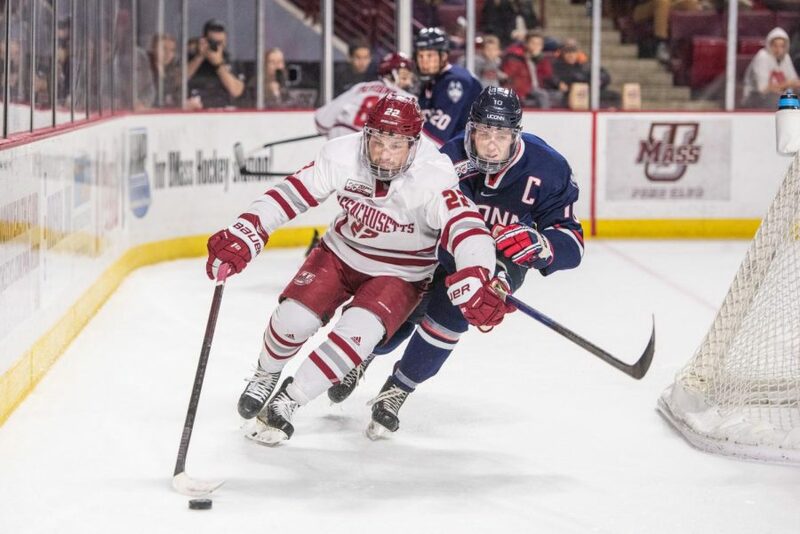 UMass’ (12-1-0, 7-0-0 Hockey East Association) exceptional November slate that saw the Minutemen go a perfect 7-0-0 while outscoring opponents 28-14 in that time, propelled them to the highest ranking in program history and set up all sorts intrigue with their upcoming series with Quinnipiac this weekend. Serving as the first team that could possibly dethrone UMass from its top spot, the No. 8 Bobcats (13-2-0, 6-2-0 Eastern Collegiate Athletic Conference) are no slouch. Winners of their last six games—a national streak only bested by the Minutemen’s nine-game run—Quinnipiac possess a plentiful amount of talent all around the lineup. Odeen Tufto and Chase Priskie are the top two Bobcat offensive weapons with numbers that put them among the best in all of Division I hockey. Tufto is third in the country with 24 points with Priskie slots in with 19 points, good for ninth. The Bobcat power play has struck often this season, converting at a 26.9 percent clip. Priskie is the most prolific scorer on the man-advantage in the country with six power play strikes. Goalies Keith Petruzelli and Andrew Shortridge have pulled double-duty for Quinnipiac in net this season. Petruzelli has played in 10 games while Shortridge has appeared in five, but both have respectable numbers. Petruzelli boasts a 2.11 goals-against average and a .911 save percentage. Shortridge has slightly better stats with a 1.00 goals-against average and a .926 save percentage. Puck drop for Friday night’s game in Hamden is set for 7 p.m. Saturday’s game is set to begin at 7:30 at the Mullins Center.